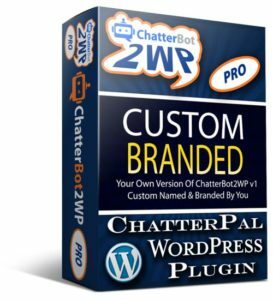 ChatterBot2WP ChatterPal Plugins For WordPress – Insert ChatterPal campaigns or demos into your WordPress site or ChatterPal Agency site. Adding ChatterPal campaign code to a WordPress website can be a real pain! Provide the easiest way to add your ChatterPal campaign code to your own or to your clients WordPress websites. Do all the hard work for you. You just add the campaign ID and activate. Quickly generate customer demo pages using your own domain name. Come with full support and upgrades. Custom branding for ChatterPal Agency owners is also available. This is the plugin to add ChatterPal Campaigns to your WordPress Website. Perfect for adding a single 3D presenter & chat bot to your entire website or just the home/front page. No more messy code injection. This plugin adds all of the code required to display your campaign. On the plugin setting screen, enter your campaign ID, choose your options and save. Your campaign will instantly appear on your website. 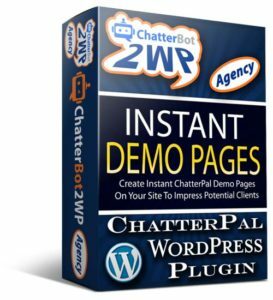 This is the plugin for ChatterPal Agency websites. The easiest way to add demo ChatterPal campaign pages to your site. This plugin creates a new page template that contains all the code required to display a demonstration campaign. Select the template and add just the campaign ID to the content. You can then provide your client with a demonstration using your own domain name.